Product prices and availability are accurate as of 2019-04-22 21:30:04 UTC and are subject to change. Any price and availability information displayed on http://www.amazon.com/ at the time of purchase will apply to the purchase of this product. Designed to commemorate Italy's famed Mille Miglia auto race, the Chopard Mille Miglia GMT stainless steel men's automatic chronograph watch perfectly balances a high fashion sensibility with a precisely tuned timepiece for intense sporting lifestyles. Synonymous with beauty and innovation, the Chopard watch company has become one of the leading names in luxury watches and in the jewelry industry. 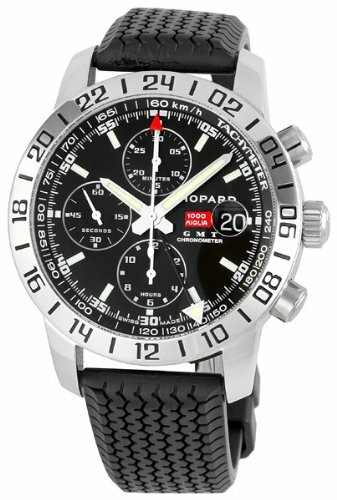 And in the late 1980s, Chopard became a sponsor of the Mille Miglia, a 1000-mile open-road endurance race that took place between 1927 and 1957. Since 1977, it was revived as the Mille Miglia Storica, which parades pre-1957 cars for several day through multiple Italian cities. 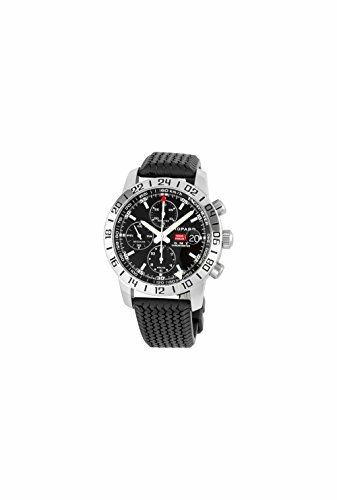 The Mille Miglia Tycoon (model 16/8992) offers a highly accurate automatic movement that's been certified by the Controle Officiel Suisse des Chronometres (or COSC, the official Swiss chronometer inspection body). The round watch case measures 42mm (1.65 inches) and 13mm thick (0.51 inches), and it's topped by a fixed bezel with 24-hour markings. In addition to two large, luminescent hands (with seconds hand), this watch includes a red-tipped hand that can track a second time zone. The black dial includes three tonal chrono subdials, luminous stick hour markers, a magnified date window at 3 o'clock, and tachymeter readings running around the outside of the dial (which can be used to measure time over distance). It's completed by a black leather strap with circular openings running down the middle and tonal stitching accents. Other features include a scratch-resistant sapphire crystal and water resistance to 50 meters--suitable for swimming but not for diving. 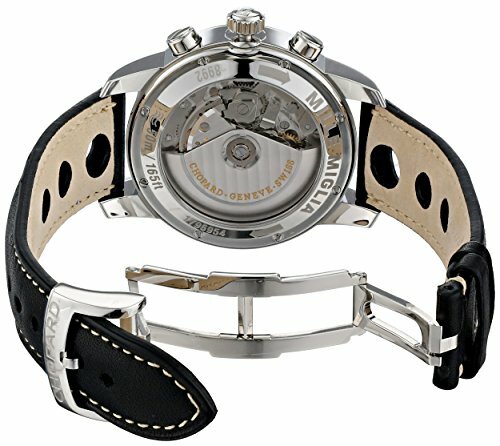 An automatic (or self-winding) watch is fitted with a device (rotor) that automatically winds the spring by using the force of gravity. It needs no battery, but it will stop if you have been physically inactive for an extended period of time--as long as you're moving, the watch will stay powered. 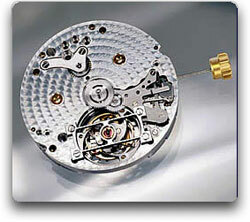 Swiss watchmaker Abraham-Louis Perrelet invented the self-winding mechanism in 1770. It worked on the same principle as a modern pedometer, and was designed to wind as the owner walked. In a nod to its history, Chopard has returned to making its own award-winning watch movements. Louis-Ulysse Chopard, a hereditary watchmaker, opened the first Chopard watchmaking workshop in 1860 in a small town of Sonvilier located in the Swiss Jura Mountains, concentrating on developing precise pocket watches and chronometers. After Chopard was purchased by jewelry entrepreneur Karl Scheufele from Louis-Ulysse's grandson Paul-Andre in 1963, Scheufele modernized the company and implemented a focus on integrating timepieces with stylish jewelry design. Scheufele also returned the company to its traditional roots in manufacturing its own mechanical watch movements, and in 1996 the L.U.C 1860 movement was introduced with a Breguet balance sprint and 22 carat gold microrotor. The following year, it was chosen as watch of the year by trade journalists and watch dealers. In 1976, Chopard unveiled the now-famed Happy Diamonds collection, which featured mobile diamonds that floated freely between two transparent sapphire crystals. 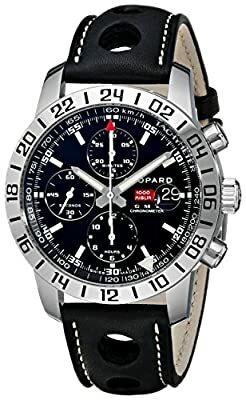 And in 1988, Chopard teamed up with the Mille Miglia, an annual Italian rally where vintage and classic cars take part, to create special edition watches every year. In the modern production facilities at Pfozheim (Germany) and Meyrin (Switzerland), many different skilled professions are represented, including designers, goldsmiths, polishers, turners, toolmakers, jewelry setters, and steel engravers--all working with a great love of detail and the utmost precision.